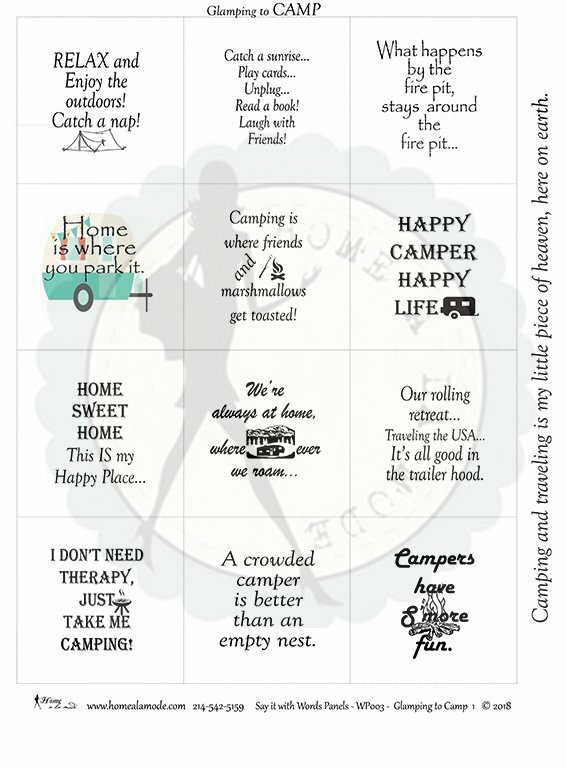 Say it with words… Glamping to Camp is a Home a la mode word panel that is all about camping in your RV, 5th wheel, cabin, tent or anyway you enjoys the outdoors. Cute and fun to share on the road or with your friends. Make a quilt to show off your personality on the road…Like: RELAX and Enjoy the outdoors! Catch a nap! - Catch a sunrise... Play cards...Unplug...Read a book! Laugh with Friends! - What happens by the fire pit, stays around the fire pit...- Home is where you park it! - Camping is where friends and marshmellows get toasted! - HAPPY CAMPER... HAPPY LIFE!!! - Home Sweet Home This IS my Happy Place... - We’re always at home, where ever we roam...- Our rolling retreat...Traveling the USA...- I don’t need therapy, just take me camping! - A crowded camper is better than an empty nest. - Campers have s’more fun. - Camping and traveling is my little piece of heaven, here on earth.